Durango Closed Beta Test is now available! 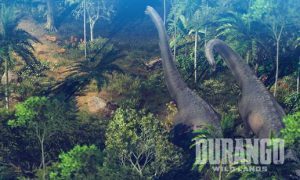 Durango is the next evolution of fully-featured MMO experiences on mobile, nominated as E3’s Best Mobile/Handheld of 2017 at Game Critics Awards, giving you full freedom to roam and choose your own gameplay, all while meshing unique exploration and city building experiences with real-time collaborative and head-to-head battles against enemy clans and colossal dinosaurs. 1.Photos/Media/Files must be enabled to attach in-game screenshots for CS. 1. Microphone allows players to utilize voice chat features. 2. Photos/Media/Files allows for saving screenshots. Please note that optional permission does not affect the gameplay.